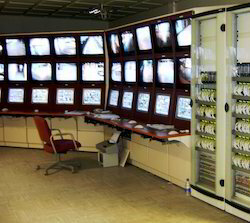 Video surveillance system monitors the behaviour, activities, or other changing information, usually, of people from a distance by means of electronic equipment. CCTV is a collection of video cameras used for video surveillance. CCTV is used in areas where there is an increased need for security and monitoring, such as Shopping malls, hotels, banks, jewellery shops, Airports and many public places. 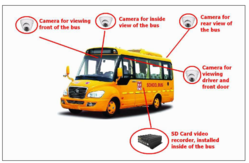 uild safer routes, capture and record passenger and driver behavior, accelerate incident investigation, get a bird's eye view of fleet and do lot more to amp up safety of your drivers and passengers.Be it a school bus or a passenger bus, public transportation authorities have a lot to worry about the safety of their passengers. 3S has pioneered as a leader in various surveillance solutions. Our solutions has been implemented in various verticals which include Manufacturing, FMCG, IT, Institutions, Health Care etc. Hybrid Surveillance System comprises of DVR - Digital Video Recording Systems apart from all that is available in the Analog Surveiilance System. At present, this system is most widely used at all places. With the availability of Broadband Communication, the demand for this system has grown in the recent times. Security and surveillance is one of the fastest growing applications for fixed wireless equipment. Government agencies, municipalities, and private enterprises are all in the process of enhancing security through the use of increased video surveillance. The objective of video surveillance is to monitor, record the events and to retrieve the same as and when required. Video surveillance not only provides enhanced security but also improves productivity. The in-vehicle video surveillance system allows you to live video stream up to 4 cameras from within the vehicle. Video footage and data is stored in a secure black box, making it foolproof, incase of an incident. Unlimited number of vehicles in various geographical areas can be tracked and viewed on any device, eliminating the need for security personnel’s. Trans Oceanic Intelligence Solutions Pvt. Ltd.
Orion Security Solutions (OSS) offers a full line of advanced video surveillance products and services. Our video recording products are the central most important component of our elite systems and are what distinguishes OSS systems from all competitive products. CCTV camera is an integral part of building security. Annual maintenance and calibration is the key to maintaining the camera’s high performance. When these routine services are ignored, your risk increases. Fostered with massive business understanding and know-how of this arena, we have been engrossed in delivering Home Video Surveillance System Service. Delivered by a trained workforce, these offered services could be purchased from us as per our patrons’ changing needs in multiple delivering provisions. Together with this, we deliver these at most affordable rates.